Oh cruel fates, why do you taunt us so? 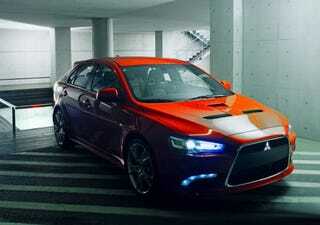 Images of the Mitsubishi Lancer Prototype-S have surfaced and we are aching with envy. The prototype is obviously more sneak preview than prototype and give a peak at the pending Lancer Sportback Ralliart 5-door slated for introduction in the European market. Mitsubishi, you are so cruel, please consider passing this on to your product planners from every Evo nut in the US: Please, please, please bring this to the US. We're begging you. Have you seen the Subaru WRX STI? You would mop up big time with an EVO hatch. Do it, come on, you know you want to.